Obviously the Guangzhou Metro company (in Southern China) is worried about their safety rails to be damaged. I have never seen someone doing it, but then this proves the effectiveness of the prohibition sign. When you happen to go to Guangzhou one day, please notice the important absence of the usual signs found such as on german public buses and mteros: There aren’t any sign saying “no graffiti”, “no ice-cream“, “no french fries” in Guangzhou, China. People are happily eating and drinking in the metro, but they do not feel the need to express their suppressed angers by vandalism. But not so in Hong Kong, now also part of China. In the Hong Kong it is forbidden to eat and even drink in the metro with a fine of 5,000 HK$ if caught. Please also note the absence of the threat of a fine in the Guangzhou metro. 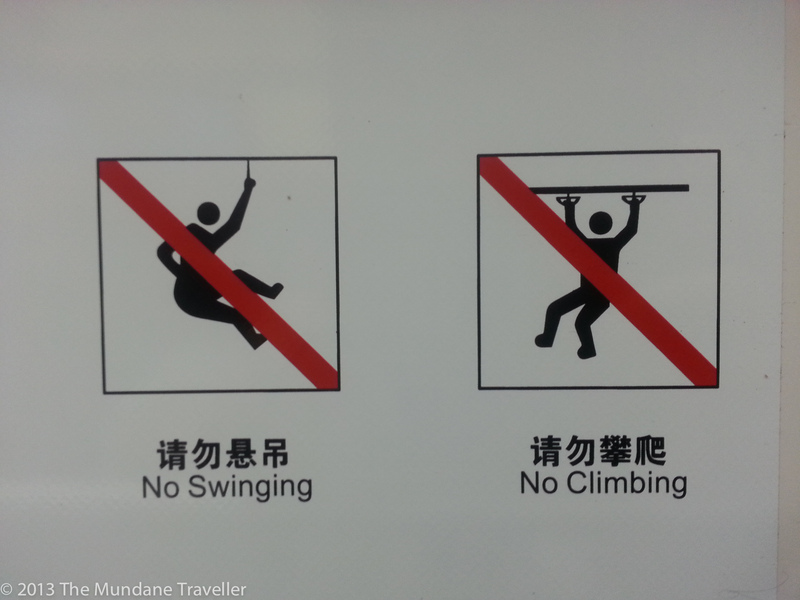 Even if you imitate a bat, a koala or a monkey in the Guangzhou metro, it is of no hard consequence. I tried it myself briefly – nobody even cared or looked at me strangely which I take as a sign of great social tolerance and freedom for odd behaviour, which is why China – besides of its many imperfections – a very good place to be nowadays.